I rub the extraneous key softly while I fumble through my key chain for my house key. The worn key no longer opens any door. It doesn’t start my car or my husband’s. It doesn’t open the lock that secures my solo canoe to the car in summertime. Nonetheless, it hangs on my key chain, often forgotten, occasionally evoking a wealth of memories. Not one to misplace or lose his keys, my father surely carried this key in his trousers pocket from the day the real estate agent first handed it to him in 1942 until he died 59 years later, still living in the house I grew up in. 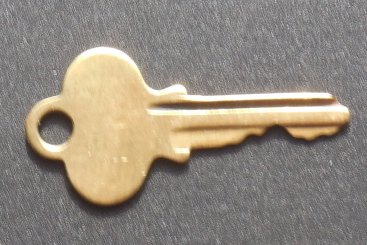 When Dad died in 2001, I removed my key to the house that was no longer ours and replaced it with his. Somehow it felt right to carry his, a constant connection to the man I adored and revered as well as to the home that I loved. One of the memories the key evokes: At 6:15, the front door opens and in walks Dad, replacing his key in his trouser pocket. He stands in the middle of the front hall, folded Atlanta Journal under his arm, and lets out his “I’m home” whistle. He places his black leather briefcase on the needlepoint chair beside the hall table, hangs his coat, and waits patiently for Mother to appear on the landing. She has been resting on the striped chaise lounge in their bedroom, reading one of her Book Find Club volumes. Now she appears, garbed in a long hostess gown, lipstick freshly applied. She descends, and they meet for a long, soulful kiss. I couldn’t possibly have seen this every night. Sometimes I was at my bedroom desk doing homework or sitting in my easy chair, one leg draped over the arm, absorbed in a Bobbsey Twins adventure or a Nancy Drew mystery. Other times I was perched next to Mother on the chaise, jabbering about my day. But I saw this scene—perhaps from the piano bench where I practiced for my twice weekly lessons—often enough for it to be fixed in my mind decades later. That kiss told me they were happy to see each other at the end of Daddy’s workday. It gave me such a sense of security that it never occurred to me that other families might be different. It wasn’t until I went to college and heard stories of my new friends’ lives that I understood how lucky I was to grow up in such a loving home. Back then, the key was new. It still had squared off edges, not yet rounded by years of use. Mom and Dad were healthy and vibrant. Mother had not yet had her stroke; Dad had not yet become a nurse, physical therapist, and household manager. That Atlanta house didn’t have a ramp, a chair lift, and widened bathroom doorways. Love was fresh and seemingly easy, life as bright as a shiny gold key. It was their love, for each other and for their three daughters, that turned the brick colonial from a house into a home—a home that, to me at least, always felt stable. Even in the bad years, the fifteen years that Mother lived in a wheelchair, talking minimally, no longer a companion for Dad, their love was evident. After completing Mother’s evening physical therapy range of motion exercises, Dad would say, “And now it’s time for KT” (kiss therapy), reminding me of those long, soulful kisses of their youth. It’s amazing how many memories a thin, worn key can evoke—memories that fill me with gratitude for my happy childhood, for my devoted parents, and for the love that blessed my home. Dad’s key is a totem I will carry with me, always.